The Troy Trojans want to get back to the state championship game after falling by one point a year ago, and the St. Mary’s-Colgan Panthers look to return to their old stomping grounds after spending the past four seasons in Class 3A. Troy is the top-ranked team in the state and has won 11 consecutive games since falling 30-29 to Phillipsburg in last year’s state championship. Colgan, which won four consecutive 2-1A state championships from 2000-2003, has played in the 2-1A title game at Fort Hays State nine times since 1998. The winner between the Trojans and Panthers will return to Hays to play on Nov. 26 against the winner of Plainville and Smith Center. Coach Derek Jasper has guided the Trojans to a 31-4 record during the last three seasons. This year, Troy has cruised through the season with little trouble. Aside from a 25-22 win at Perry-Lecompton, the Trojans have won every other game by at least two touchdowns. Troy topped Lyndon 46-19 during last week’s quarterfinals. Quarterback Reid Greaser leads the Trojans with 2,465 passing yards. Cuttar Huss is one of the state’s top receivers with 1,036 yards. Brody Winder has also hauled in 901 yards. Playing in the Crawford-Neosho-Cherokee League with all 4A Division II and 3A schools, Colgan opened the season with three losses in its first four games. Since then, the Panthers are on a seven-game winning streak and have held opponents to two touchdowns or fewer five times. The Panthers are directed by Chuck Smith, who has led the program to 343 victories and five state championships. Last week, Colgan held on for a 29-20 win over Washington County. The Panthers are back in the semifinals after falling in the quarterfinal round during each of their four seasons in Class 3A. Colgan quarterback Bill Dickey has passed for 1,130 yards with 13 touchdowns and five interceptions. Max Wilson leads the Panther rushing attack with 743 yards and 12 touchdowns. The Mid-Continent League foes match up for the second time this season. Plainville, coming off back-to-back 3-6 seasons, quickly asserted themselves as an elite team with a 20-16 season-opening home victory against Smith Center. Smith Center won the yardage battle 348-298 but the Cardinals finished plus-2 in turnover margin. The next week, the Cardinals beat Norton, 20-14, a team Smith Center defeated in overtime, 20-17, in Week 4. The Redmen, which took a sub-state loss to Phillipsburg last season, have won nine in a row and had senior standout Kaden Meitler return from injury in last week’s 42-20 road win versus La Crosse. 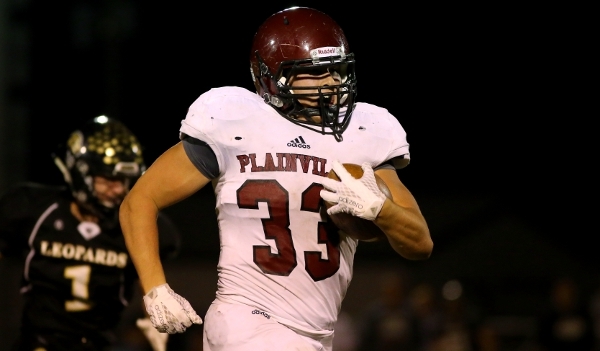 Plainville defeated La Crosse, 46-12, in Week 9. The teams have played each other four times in playoff annals. Plainville won 40-13 in 1984, while Smith Center won 69-0, 83-0 and 54-0 in ’06, ’07 and ’09. The Cardinals are back in the sub-state game for the first time since 2011. In 2010, the Cardinals went 3-6 before a seven-win improvement. This year’s team has enjoyed a similar rise, mainly because of three areas: a huge change in turnover margin and the addition of transfer senior running back Riley Nyp and freshman Jared Casey (team-high 83 tackles). Junior Hayden Gillum has another big season with 81 tackles and a Cardinal-best 11.5 for loss. From 2006-16, just four 2-1A teams reached sub-state after not reaching the playoffs the previous season. Plainville, in both ’11 and this year, is the lone squad that missed the postseason and didn’t have a winning record the previous fall. Each squad ranks in the top-4 in scoring offense and defense in 2-1A. Plainville has a total margin of 458-121, while Smith Center has a total margin of 415-113 and ranks No. 1 in scoring defense. Last season, the Cardinals averaged 32.2 points per contest and have bumped that mark to 41.6 this year. However, in 2015, the Cardinals had 18 turnovers and finished minus-8 in turnover margin. The offense averaged seven yards a play. This year, Plainville is up to 7.6 yards per play but has just 12 turnovers and is plus-18 in turnover margin. The defense has forced 30 turnovers, 20 more than last year. Electrifying senior quarterback Hayden Friend has delivered another great season with 1,812 passing, 1,042 rushing and 44 total touchdowns. Also, Friend has just eight turnovers on 279 offensive touches. Last season, Friend had 14 turnovers on 277 offensive touches. Friend had five turnovers in the first two weeks and just three since, including no fumbles. Nyp has helped Plainville go from 176 rushing yards and 5.6 yards per carry last season to 246 rushing yards and 7.1 yards per carry this year. He has 164 carries for 1,361 yards and 20 rushing scores. Nyp had 38 carries for 167 yards against Smith Center, Norton and Phillipsburg the first three weeks, including 15 carries for 81 yards against Smith Center. In the last month, Nyp has four straight 100-yard performances, including 346 against La Crosse. He also has not fumbled all year. In the last three seasons (the previous two at Logan-Palco), Nyp has never fumbled in 395 carries. Smith Center averages 305 rushing yards a contest and 74 passing yards a game. The Redmen average 6.9 yards per carry and 7.3 yards per play. Overall, Smith Center has just eight turnovers and is plus-17 in turnover margin. The La Crosse game turned on two turnovers. Meitler returned an interception for a score, and at the end of the third quarter, La Crosse had a chance to tie but fumbled near the Redmen’s goal line. Junior Trace Haven responded with an 85-yard scoring run to end the quarter. Haven leads the team with 654 rushing yards and 12 scores, part of seven players who have at least 291 rushing yards. Junior Colton Hutchinson has played well at quarterback with 747 passing yards with a 9/5 TD/INT ratio. He leads the team with 90 tackles. Smith Center has three pick-sixes this season. Plainville has played very well the last several weeks and rolled over Republic County, 49-0 last Friday, a team it defeated 58-28 in the regular season. In addition, teams have had trouble in rematch games the last two seasons. The sweeps this year include Holcomb over Scott City, Carroll over Kapaun, Dighton over Sharon Springs, West Elk over Oxford, Shawnee Mission East over Shawnee Mission North and Blue Valley over Blue Valley North. Washburn Rural did defeat Manhattan in 6A after losing to the Indians in the regular season. Last year, notable rematches that stayed with the same result in sub-state include Phillipsburg’s second win against Smith Center and Mill Valley defeating Aquinas twice in 5A. As long as Plainville maintains its level of play, the result should be another close win.